What is DB2 Workload Manager (WLM)? Workload Manager is a feature that comes with DB2 Advanced Enterprise Server and Advanced Workgroup Server editions that can classify database work into different buckets. One work bucket can get priority of execution and priority on CPU and memory resources, while another bucket of work gets a lower share of system resources. Critical business processes may need guaranteed access to maximum system resources, while a curious TOAD user needs to be restricted from getting a monopoly on the database system resources. DB2’s Workload Manager can not only be used for controlling resource consumption amongst different applications but it can also be used to build an application centric performance monitoring strategy. Application centric performance monitoring can produce some stunning performance reports which will be more easily understood by clients than a bunch of reports on I/O, memory, bufferpools, sortheap, locklist , etc. Although traditional technical reports can be a very interesting read to tech savvy DBAs, they may not make much sense to the application development community and clients. Speaking the same language as other teams can help them understand database performance. That is where DB2 Workload Management can help. Note: With DB2 Enterprise Server edition, you cannot create new workloads and service classes but you can still modify the default WLM objects for monitoring and workload management purposes. A service class defines the execution environments in which work can run. This execution environment allocates available resources (CPU, Memory, etc) to a specific threshold which determines how work is permitted to run. Think of it this way – A service class is the environment or bucket where the assigned work runs. Different buckets or service classes can have different resource controls associated with them like prefetch priority, bufferpool priority, etc and can have thresholds associated with each. A subclass is a smaller bucket inside the service superclass buckets. Although service superclass is the highest tier of work, activities run in service subclasses. 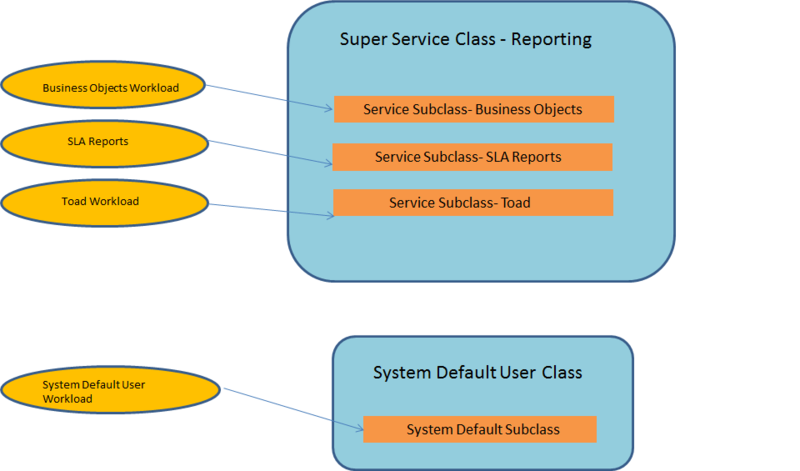 Each service superclass has a default service subclass to run activities that you do not assign to an explicitly defined subclass. You can use the SYSCAT.SERVICECLASSES catalog view to look at the default service super classes and subclasses in the system. db2 "select serviceclassname, parentserviceclassname from syscat.serviceclasses with UR"
Notice that SERVICECLASSNAMES SYSDEFAULTMAINTENANCECLASS, SYSDEFAULTSYSTEMCLASS, and SYSDEFAULTUSERCLASS do not have any PARENTSERVICECLASSNAME mentioned as they are the default superclasses. Think about a workload as a shovel that identifies the work, picks it up, and dumps it into the service classes, or buckets, for execution. DB2 WLM allows you to identify work based on various attributes like application name, session user, client workstation name, etc. Just like default service classes, DB2 has default workloads. db2 "select workloadname, serviceclassname, parentserviceclassname from syscat.workloads with UR"
As you can see from the SYSCAT.WORKLOADS catalog view, DB2 comes with 2 default workloads- SYSDEFAULTUSERWORKLOAD and SYSDEFAULTADMWORKLOAD. By our shovel and bucket model we can conclude that DB2 dumps all work coming from SYSTEMDEFAULTUSERWORKLOAD and SYSTEMDEFAULTADMINWORKLOAD into the SYSTEMDEFAULTUSERCLASS superclass and SYSTEMDEFAULTSUBCLASS sub service classes. Workclass sets are collections of different workloads grouped together. Once a workclass set has been created, we can create work action sets which define how a specific workclass set can be controlled. Work classes are always created as part of workclass sets and not as separate objects. DB2 has the below default workclass and workclassset. db2 "select workclassname, workclasssetname  from syscat.workclasses with UR"
Below is an example taken from IBM Knowledge Center. This example creates a workclass set named LARGE_QUERIES representing all DML activities with an estimated cost greater than 9999 and estimated cardinality greater than 1000. Notice the workclass set LARGE_QUERIES contains two work classes: LARGE_ESTIMATED and LARGE_CARDINALITY. Workaction sets define how to service workloads that fall under defined workclass sets. Going back to the workclass set example, the work action set named DATABASE_ACTIONS has two work actions defined. Work action ONE_CONCURRENT_QUERY will take all work that falls under workclass set LARGE_QUERIES and if concurrentdbcoordactivites >1 (there are more than one concurrent activities) and queuedactivities >1 (there are more than one queued activities) and the work belongs to workclass LARGE_ESTIMATED_COST, it will stop the execution of the query or SQL statement!! Work action TWO_CONCURRENT_QUERIES will take the work that falls under workclass set LARGE_QUERIES and if concurrentdbcoordactivites >2 (there are more than two concurrent activities) and queuedactivities >2 (there are more than two queued activities) and the work falls under LARGE_CARDINALITY workclass, it will collect activity data and let the DML continue to run. We should now have an understanding of service superclasses, service classes, workloads, work class sets, and work action sets. The below diagram depicts how we may divide work into service classes and subclasses in the database environment. How can we list details of sqls such as statement text, tables accessed , etc executing in a workload? more of that will be covered in part 2 and part 3. When we create the WLM event monitors (to be covered in part2) the below tables get created. We could query those or the WLM table functions to find information on statement text, execution time etc. Thanks for your reply. I will wait for your next post. I have a question,how much overload these WLM event monitors will cause on the database? It could cause overload on the database based on the level of data collected. Both activity metrics and aggregate activity data can be collected at a base level or the extended level. Extended data collection on the database tends to have an impact on the database and should be used only to troubleshoot specific database issues.